This person hopes that all have found at the least some relief enough to have enjoyed some of the summer break, and have had some fun, and even perhaps with family and friends. Another year. . . excellent, well, this person wonders what this year shall bring. A little effort is rewarded with some relaxation and a lot of satisfaction. Face the fence, through it, then the dream becomes the adventure, we go onto and into the good stuff, creating those memories that shall be kept. As this person is writing this up, the sunrise is climbing down the Kaimai Ranges towards the dam, as the cicada symphony rendering the normal avian chorus to a support role. And because of the season, time was with family yet also some time was truly enjoyed outdoors both with my wife, and alone. Coastal ‘cursions on white sanded bands ‘tween turquoisian waters and emerald green grassed fields, beneath forests of olde pohutukawa trees with various shades of faded red flowers. Observing Matuku, white faced blue heron have it’s own extended battle to capture and begin to eat a tuna, long finned eel, that was more than its own height. 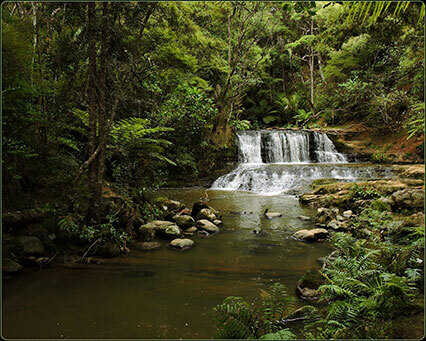 A favoured patch of bush, that once was a Pa Site, and now a tiny scenic reserve, is a haven of Kanuka, Totara, and other native trees, surrounding two streams that turn, twist, boil ‘n toil before tumbling over several waterfalls each. Between Summer’s Symphonia created through that delightfully deafening cicada chorus, could just be heard the hordes of Tui, Grey Warbler, Riroriro, while feeling the air pressure change as Kereru clan flew close by. Summer and its hordes only existed in the distance . . . life here was all about the streams’ sounds, and the bush flexed only of silentlicously soft coastal breezes. Sitting on mossy rocks with clad feet cooling in a cascading stream of crystal clarity, at peace, at one, this person dissolves and becomes totally at one with nature. Papatuanuku as cicada landed on the gear and hisself. Even in a big city, making the smallest effort can be so truly rewarding while able and capable. Pockets of delight are often only metres away, and anything from minutes to hours can reset the headspace, or go at least some way towards finding an inner peace, and perhaps inspiration can become the driver to the next journey of similar beauty. Memories can be built upon, expanded, and maybe eventually shared, though the location of the sanctuary is often best kept secret, because that is why we went there in the first place. Our own times ‘n spaces are tapu, sacred. Places to escape to, time and again, as often as practical, but first we need to cross those fences, both real and/or perceived in whatever form they take. Until next, keep on making those dreams real while you can, and the adventures’ memories shall be lasting when the laying up comes along.